So the leaves have started to fall, there’s a definite chill in the air and that unmistakable scent of burning wood is a clear advent of the witching season and the prelude to winter. It’s only a few more weeks to Halloween and one year since Casa Bella’s Halloween. Along with narcissism, Halloween and associated subjects are some of the most read topics of this blog. In fact, Casa Bella’s Halloween featuring one of the most ambitious and certainly spookiest dinner parties ever to take place at Casa Bella was one of the most read articles last year. What, you didn’t read it? No problem. Click here to read the article and view the spooky video footage. Given the above, it naturally made sense to me to reprise two of Casa Bella’s favourite Halloween posts, starting with Halloween’s Darker Side. The side that I believe, somewhat ironically, tends to get lost amidst all of the commercial ‘fun’ side of this holiday season. For some parents, Halloween is the only time of year when they get to exhibit their creative flair for costume design whilst encouraging their children to go out, join a gang and terrorize the neighbourhood. For most, Halloween is about ’ghoulish’ fun and the opportunity to greedily share in the bounty extorted by phantoms and demons. But All Hallow’s Eve does have a more sinister side. 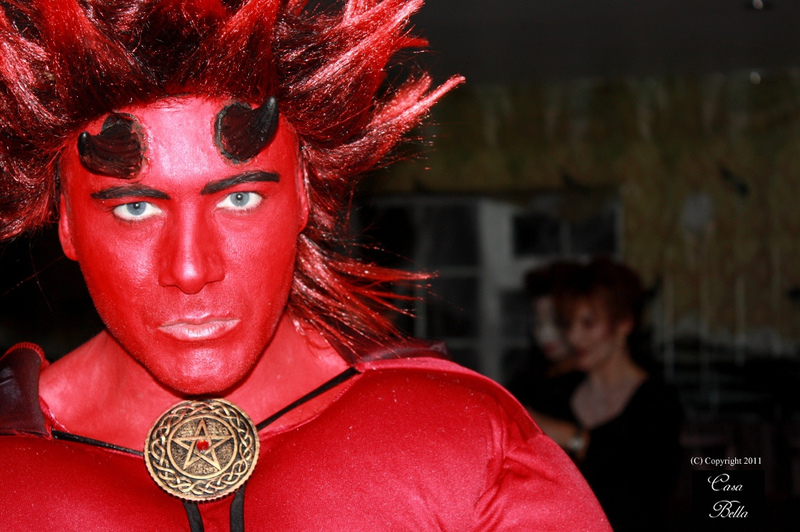 Well, what would do you expect from a festival that celebrates the ‘Lord of darkness’? Some parents won’t allow their children to go trick or treating unless they can go with them. Some say it’s because they’re trying to recapture their youth, others say that its in response to a series of horrific cases where children were actually hurt by some of the sweets they collected; razor blade chocolates and insect killer laced sweets were just some of the cases reported to police. What’s worse is that the investigation into such cases often proves difficult due to the fact that children mix and share their sweets making it difficult to establish their origin, and it this technicality which makes the practice even more alluring to would be criminals and terrifying to parents. But it’s not just spirits that come out on the 31st October, pranksters have their own devilish fun with unpopular neighbours. One reported case involved some boys who took it upon themselves to exact revenge on a busy body neighbour. The 49 year old spinster, who’d often highlight the boys’ misdemeanours to their parents, lived alone. One year, the pranksters decided to impersonate the woman’s peculiar voice and call the police, stating that there was someone in her house. Units were dispatched once, twice, but they took their time on the third occasion only to find the woman barely alive upon arrival; she had actually been robbed, stabbed and left for dead. Now that’s irony for you. Justice was served though; the pranksters and the drug fuelled robber were apprehended. In some parts of the United States, they decorate streets with the same zeal on Halloween as they do at Christmas, so it was understandable that 24 hours had passed before residents realised that what looked like an amazingly realistic dummy hanging from a lamp post was actually a real corpse, that of a woman who committed suicide because her husband had left her. But consider this, next time you smell something ‘funny’ in your hotel room, you may want to report it to management immediately. This advice would have been helpful to a newlywed couple who, after a zombie themed wedding, excitedly checked into a hotel room in Las Vegas where both noticed an unpleasant smell but neither was willing to report it, such was their rapture. It was only the following morning, motivated by the chance of a discount, that they informed hotel staff who, after a thorough search of the room, concluded there was only one place they hadn’t looked; inside the mattress. That’s when they found the dead body of a young girl who had been stuffed into the box spring! She was later identified as one of the many prostitutes that haunt ‘the strip’. These are just some of the instances that can be explained but what about those that can’t? For example, those times when you could swear you heard somebody you live with come home, close the front door, dump their keys on the side, but never materialise. So, you check the house only to discover you’re alone. Or my personal favourite, so much so that it happens to a character in one of my books, she hears her boyfriend come home and she calls out to him but there’s no reply. Perplexed, she goes through the house, calling his name but nothing. Then the phone rings, she picks it up. “Hello baby, it’s me,” he says, and that’s when she realises, to her terror; somebody else is in the house with her, and it isn’t her boyfriend. If you’ve experienced something like this, why not share it with everybody? It is the witching season after all. The Box Spring Mattress would be one to send me over the Edge that was really a spooky Tale ! !